Abstract. As a consequence of an advancing discrepancy between supply of suitable grafts and demand from potential recipients, less than optimal organs are increasingly being used. Although clinical studies demonstrate the involvement of various risk factors, including donor age and duration of ischemia on long-term graft outcome, their individual contribution and correlation has not been followed experimentally. After cold ischemic times of 5, 60, and 120 min, kidney allografts of 3-, 12-, and 18-mo-old Fischer 344 donors were transplanted into 3-mo-old Lewis rats. Age-related changes were examined in matched native uninephrectomized controls. Proteinuria and creatinine clearance were determined, and histologic and immunohistologic studies were assessed and quantified at the end of the observation period (20 wk). All grafts functioned satisfactorily with the exception of one graft each from 12- and 18-mo-old donors with prolonged ischemia (120 min). Functional deterioration and structural changes progressed in parallel to increasing donor age and prolonged ischemia. The impact of expanded ischemia was particularly detrimental in grafts from older donor animals. Donor age and duration of ischemia act in a synergistic manner in our model. Brief ischemic times seem of particular relevance when grafts from older donors are being used. An increasing discrepancy between patients listed for kidney grafts and potential donors is currently being observed (1). In addition, demographic data of the donor pool have changed. While the number of donors >50 yr old has increased, the number of those <50 yr old has remained steady. To meet the expanding demand for organ supply, “marginal donors” are increasingly used (2). The term “marginal donor,” however, is ill-defined. Although several risk factors seem influential, donor age has been shown to be of particular relevance in clinical studies (3,4,5,6,7). Additional damage as a consequence of ischemia/reperfusion may decrease the quality further. As a result of those events, grafts from older donors may show age-reduced functional capacity in addition to an increased sensitivity toward prolonged ischemia. This may contribute to specific and nonspecific immunologic events after transplantation and reduce long-term graft outcome. Experimental and clinical evidence suggests that the quality of the graft before transplantation may contribute to various alloantigen-dependent and -independent events after engraftment ; those factors may act in concert (8,9,10). The concept that nonspecific events such as ischemia/reperfusion injury may accelerate changes of an already less than optimal graft is supported by clinical observations. Superior survival rates from living, unrelated donors compared to similar mismatched cadaver grafts have been shown (11). In addition, it has been demonstrated recently that prolonged ischemia is associated with increasing rates of acute rejection episodes, suggesting an influence of alloantigen-independent factors on alloantigen-specific events (12,13,14). Because the impact of both donor age and ischemia/reperfusion injury on chronic graft deterioration is gaining increasing importance when marginal grafts are used, we tested the individual contribution and correlation of those risk factors in an experimental renal allograft model. Male inbred rats (Harlan-Winkelmann, Borchen, Germany) were used throughout the experiments. Focusing on the relevance of alloantigen-independent factors (donor age and prolonged ischemia) on alloantigen-dependent events (chronic renal allograft dysfunction), Fischer 344 (F-344, RT11v1) allografts were transplanted into Lewis (LEW, RT11) recipients, using standard microsurgical techniques. Briefly, grafts were transplanted orthotopically to recipient renal vessels and ureter by end-to-end anastomosis using 10-0 prolene. One native kidney was removed during transplantation ; the remaining kidney was removed 10 d later. Cyclosporin A treatment was given for 10 d at a dosage of 1.5 mg/kg per d to overcome early acute rejection episodes in this model. Before harvesting, grafts were perfused with UW solution and kept at 4°C for the respective ischemic time. Experimental groups included allografts from donor animals ages 3 and 12 mo with ischemic times (IT) of 5, 60, and 120 min. Grafts of 18-mo-old donors were subjected to short (5 min) and prolonged (120 min) ischemic times, as the most pronounced differences were expected between those groups (n = 6 per group) (Figure 1). To assess the influence of increasing age on a single kidney (F-344 ; ages 3, 12, 18, and 23 mo ; n = 5 per group), native animals were nephrectomized and compared to their respective allografts. The experimental model. Fischer 344 (F-344) renal allografts of 3-, 12-, and 18-mo-old donor animals were grafted into 3-mo-old recipients after cold ischemic times of 5, 60, and 120 min. UW solution was used for perfusion and preservation. Initial acute rejection episodes in this model were treated with cyclosporin A (1.5 mg/kg per d for 10 d). Grafts were followed for an observation period of 20 mo. Creatinine clearance was determined at the beginning and at the end of the observation period in all groups after collecting serum and urine samples and then calculating : Urine creatinine (mg/ml) × Urine volume (ml)/Serum creatinine (mg/ml) × Body surface (m2) × Time of urine collection (min). Proteinuria was tested at 2 wk and then at monthly intervals. Protein excretion (mg/24 h) was measured by precipitation with 20% CCl3COOH. Turbidity was assessed at a wavelength of 415 nm using a Hitachi 911 analyzer. At the end of the observation period, kidneys from native uninephrectomized control animals ages 3, 12, 18, and 23 mo were examined and compared to allografts ; specimens were fixed in 5% buffered formalin. Paraffin sections were stained with hematoxylin and eosin and periodic acid-Schiff and assessed by light microscopy. To determine the extent of glomerulosclerosis, glomeruli per kidney were counted and the ratio was expressed as a percentage. In addition, the extent of arteriosclerosis, cellular infiltrates, tubular atrophy, and interstitial fibrosis was quantified on a 0 to 4+ scale (4+ = strongest structural deterioration>20 fields of view [FV] per section were evaluated at ×400). Portions of representative kidneys in experimental and control grafts were examined at the end of the observation period, snap-frozen in liquid nitrogen, cut (4 μm), fixed in acetone for 10 min, air-dried, and stained with mouse monoclonal antibodies (mAb) to CD5+ T cells (OX-19), CD4+ T helper cells (W3/25), CD8+ T cytotoxic/suppressor cells (OX-8), monocytes/macrophages (ED1), and MHC class II (OX3 ; all mAb from Serotec, Wiesbaden, Germany). After specific mAb staining, the sections were then interacted with rabbit anti-mouse IgG, following mouse anti-alkaline phosphatase complex ; sections were counterstained with hematoxylin. MHC class II was quantified on a 0 to 4+ scale (4+ = dense). Positive cell counts were expressed as mean ± SD of cells/FV (>20 FV per section were evaluated at ×400). Statistical significance was ascertained using ANOVA. Although urinary protein excretion increased progressively in parallel with increasing age in unilaterally nephrectomized native rats, a decline of creatinine clearance was observed. 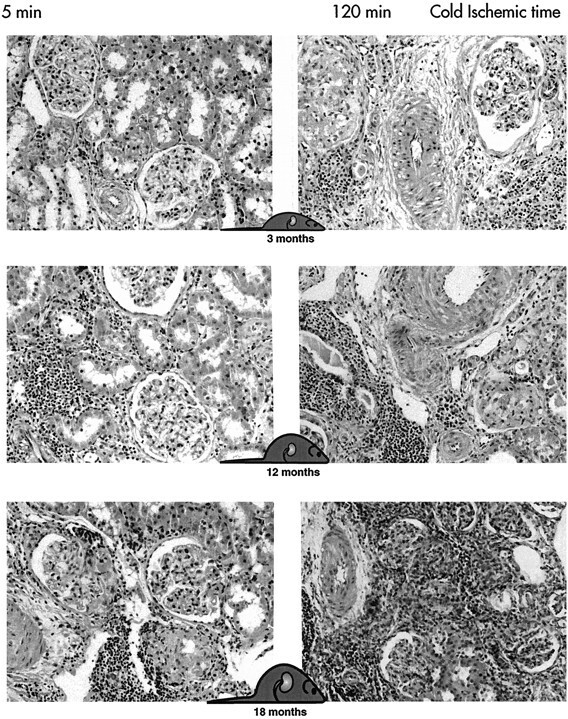 Significantly different data were obtained between single kidneys of 3-, 12-, and 18-mo-old animals versus 23-mo-old rats 0.02, respectively) (Figure 2). Renal capacity (proteinuria, creatinine clearance) of native uninephrectomized F-344 rats is shown in relation to donor age. 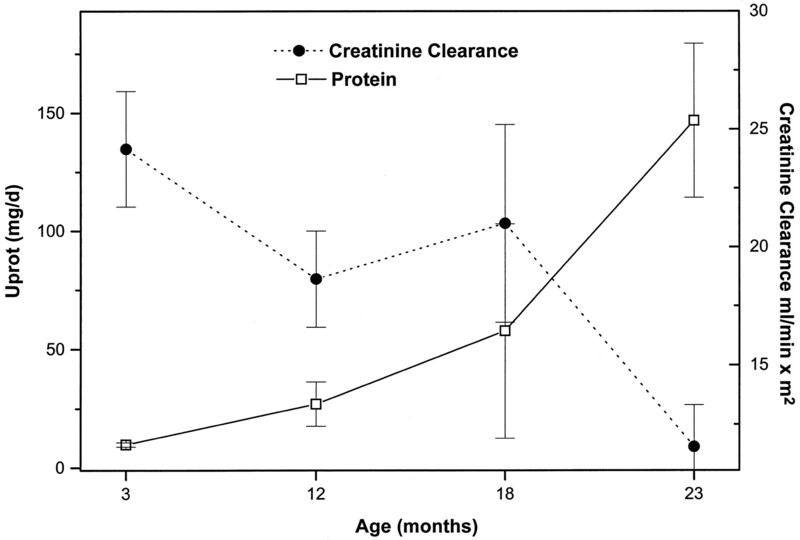 Both urinary protein excretion and creatinine were significantly different between single kidneys of different age groups (3, 12, and 18 mo versus 23 mo ; P < 0.02). With the exception of two allografted recipients, all animals survived the observation period of 20 wk. Those animals dying of renal failure by 18 and 16 wk included allografts from donor animals ages 12 and 18 mo, respectively, with an ischemic time of 120 min. Creatinine clearance decreased in parallel with donor age and prolongation of ischemia by the end of the observation period (20 wk). Overall, prolonging ischemia was more detrimental in grafts from older donors. Grafts from 18-mo-old donor animals with brief ischemic times (IT, 5 min) demonstrated significantly reduced creatinine clearance rates compared to those from 3-mo-old donors (P < 0.05), whereas no significant differences were observed between grafts from 18- and 12-mo-old donor animals (P = 0.13). Creatinine clearance was significantly reduced when ischemia was prolonged to 120 min in grafts from 3-mo-old donor animals (P < 0.01 and P < 0.015 comparing ischemic times of 5 and 60 min, respectively). Similarly, clearance rates were significantly reduced in grafts from 12- and 18-mo-old donor animals when ischemia was prolonged (12 mo, IT of 120 min versus IT of 5 and 60 min : P < 0.001 ; 18 mo, IT of 120 min versus IT of 5 min : P < 0.03). Creatinine clearance decreased with prolonged ischemia and increasing age. Although a synergistic trend was observed, differences were not significant between grafts from 12- and 18-mo-old donors (18 mo, IT of 120 min versus 12 mo, IT of 120 min : P = 0.28 ; 18 mo, IT of 120 min versus 3 mo, IT of 120 min : P = 0.1) (Figure 3). Creatinine clearance decreased in allografts from donor animals ages 3, 12, and 18 mo with ischemic times of 5, 60, and 120 min in parallel with donor age or prolongation of ischemia. The correlation of those factors demonstrated a synergistic trend. Both increasing donor age and prolonged ischemia resulted in progressively advanced protein excretion. 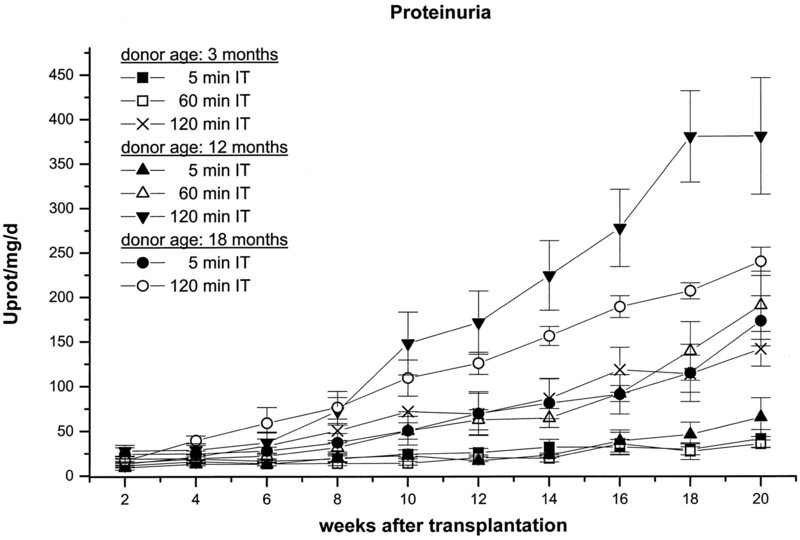 Proteinuria of kidneys from donor animals ages 3 and 12 mo with brief ischemic times (5 min) was not significantly different (3 mo, IT of 5 min versus 12 mo, IT of 5 min by 20 wk : P = 0.29). However, increasing donor age to 18 mo was followed by a significant increase in proteinuria (3 mo, IT of 5 min versus 18 mo, IT of 5 min : P < 0.02 ; and 12 mo, IT of 5 min versus 18 mo, IT of 5 min : P < 0.001). Allografts from 3- and 12-mo donor animals demonstrated increased proteinuria in parallel with prolongation of ischemia (by 20 wk : 3 mo, IT of 5 min versus 3 mo, IT of 120 min : P < 0.001 ; 12 mo, IT of 5 min versus 12 mo, IT of 120 min : P < 0.006). Prolonging ischemia in allografts from old donors (18 mo) did not result in a further progression of proteinuria (18 mo, IT of 5 min versus 18 mo, IT of 120 min : P = 0.07). Interestingly, proteinuria in grafts from 12-mo-old donors with moderate ischemia (60 min) was comparable to those in grafts from younger donors (3 mo) with prolonged (120 min) ischemia (12 mo, IT of 60 min versus 3 mo, IT of 120 min : P = 0.29) (Figure 4). Proteinuria of allografts from donor animals of increasing age with prolonged ischemia is shown. Proteinuria progressed in parallel with an increasing donor age. Prolonging ischemia resulted in a significant increase in grafts from 3- and 12-mo-old donor animals. Grafts from 18-mo-old donors with prolonged ischemia (120 min) demonstrated increasing urinary protein excretion, however not reaching significant differences. By the end of the observation period, cellular infiltrates, glomerulo- and arteriosclerosis, tubular atrophy, and interstitial fibrosis had advanced in parallel with increasing age in control groups and transplanted animals. Allografts from 3- and 12-mo-old donors demonstrated progressive morphologic changes in parallel with prolonged ischemia. 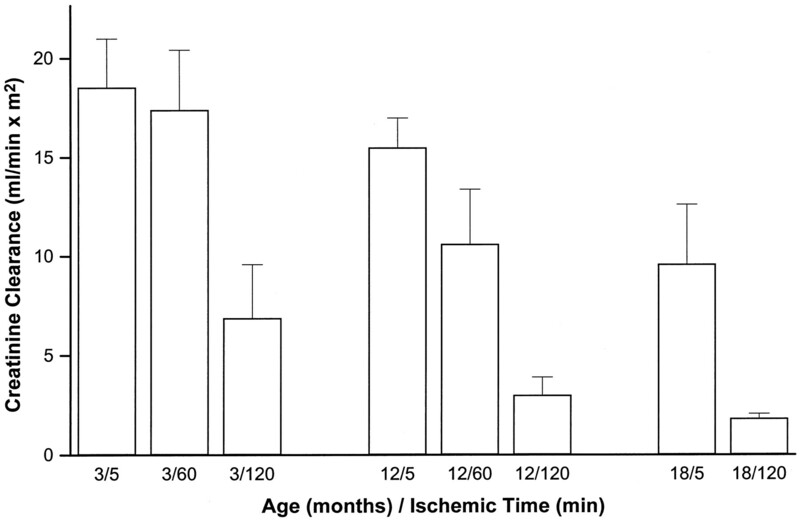 Changes in grafts from 18-mo-old donors were already advanced, with brief ischemic times progressing only slightly with prolonged ischemia (Figure 5). Representative photomicrographs (hematoxylin and eosin stains, magnification ×400) of allografts from 3-, 12-, and 18-mo-old donor animals with ischemic times of 5 and 120 min are shown after an observation period of 20 wk. Grafts from young donors with a brief ischemic time showed only minor structural changes. Prolonging ischemia to 120 min increased glomerulosclerosis and tubular atrophy while interstitial fibrosis became evident. These alterations advanced drastically in grafts from older donors with prolonged ischemia. Grafts from very old donor animals demonstrated already advanced structural changes with cold ischemic times of 5 min. These changes progressed only slightly when ischemia was prolonged to 120 min. The 3- and 12-mo-old uninephrectomized control animals demonstrated a normal morphology, while structural changes became obvious in animals of 18 and 23 mo. In those animals, mild-to-moderate glomerulo- and arteriosclerosis were observed (approximately 20 and 40% ; 1 to 2+ and 2+, respectively), while tubular atrophy and fibrosis became evident. Allografts from 3-mo-old donors with a brief ischemia (5 min) demonstrated minor glomerulo- and arteriosclerosis by 20 wk (<25% and 2+, respectively) ; few tubules were atrophic while fibrosis was minor (1 to 2+). Increasing ischemia to 60 min did not result in a significant progression of structural changes. However, prolonging ischemia to 120 min increased glomerulosclerosis to 40% ; arteriosclerosis and tubular atrophy advanced (2 to 3+), while interstitial fibrosis became more evident (2 to 3+). Structural changes in allografts of 12-mo-old donor animals with ischemic times of 60 min were comparable to those of allografts from 3-mo-old animals with ischemic times of 120 min. Grafts from 12-mo-old donor animals with a brief ischemic time demonstrated approximately 30% of glomerulosclerosis and a medium degree of arteriosclerosis (2+). Prolonging ischemia to 60 min increased glomerulosclerosis to 40%, while tubular atrophy and interstitial fibrosis became evident (2 to 3+). Further prolongation of ischemia resulted in an increase of glomerulosclerosis (45%) and arteriosclerosis (3+), while tubular atrophy and fibrosis advanced. Allografts from 18-mo-old donor animals with brief ischemic times demonstrated advanced glomerulo- and arteriosclerosis by 20 wk (approximately 45% and 3 to 4+, respectively) ; tubular atrophy (2 to 3+) and fibrosis (2 to 3+) were obvious. Prolonging ischemia to 120 min progressed glomerulo- and arteriosclerosis only slightly (50% and 3 to 4+). Similarly, tubular atrophy and interstitial fibrosis demonstrated a minor increase (3+ and 3 to 4+) (Figure 5). Overall, we observed an augmentation of cellular infiltrates in parallel with increasing age and prolongation of ischemia in all experimental groups by the end of the observation period. Only few cellular infiltrates were observed in 3- and 12-mo-old uninephrectomized control animals. 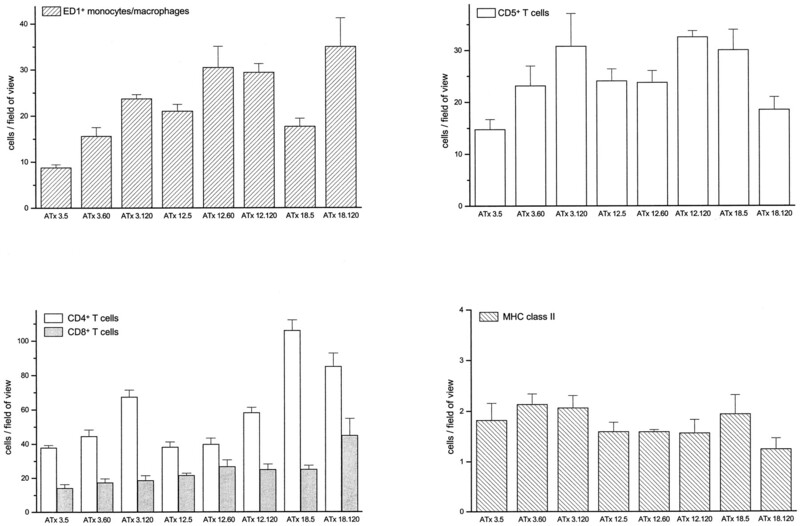 Cellular infiltrates (ED1+ monocytes/macrophages, T cells, and their subsets) and MHC II expression remained minor while increasing significantly in single kidneys of 18- and 23-mo-old animals (P < 0.05 ; not shown). Allografts were infiltrated progressively by monocytes/macrophages with increasing donor age (18-mo versus 3-mo-old animals, IT of 5 min : P < 0.03) and prolonged ischemia (3 mo, IT of 5 min versus IT of 120 min : P < 0.0002 ; 12 mo, IT of 5 min versus IT of 120 min : P < 0.01). CD5+ T cells increased significantly in all groups when ischemia was prolonged from 5 to 120 min (P < 0.05). A minor decrease, although not reaching statistical significance, was observed in allografts from 18-mo-old donors when ischemia was prolonged to 120 min. CD4+ T cells were found in high numbers in all experimental groups. A significant increase was observed in allografts of 3-mo-old donors when ischemia was prolonged from 5 to 120 min (P < 0.002). In all other groups, amounts of CD4+ cells remained high. A minor decrease observed in allografts of 18-mo-old animals with prolonged ischemia did not reach statistical significance (P = 0.15). Overall, CD8+ T cells were less pronounced ; statistically significant differences were observed when comparing grafts from 18-mo-old animals versus 3-mo-old donors with brief (IT 5 min : P < 0.03) or prolonged ischemia (IT 120 min : P < 0.03). MHC II was expressed strongly in all experimental groups and did not increase significantly in parallel with donor age or prolongation of ischemia (Figure 6). Cellular infiltrates (ED1+ monocytes/macrophages, CD5+ T cells and their subsets CD4+ and CD8+ T cells, and MHC II expression) were quantified as cells/field of view or on a 0 to 4+ scale in allografts from 3- (ATx 3), 12- (ATx 12), and 18- (ATx 18) mo-old donor animals with ischemic times of 5, 60, and 120 min (ATx 3.5, x.60, and x.120, etc.). Cellular infiltrates increased in parallel with donor age and prolongation of ischemia ; MHC II was expressed moderately in all experimental groups. Less than optimal grafts are increasingly used for transplantation as a consequence of growing demand. Although the term marginal donor remains ill-defined, donor age seems to be a critical factor for the quality of the graft. Several experimental and clinical studies demonstrated the influential role of this event for the development of chronic graft dysfunction (3,4,5,6,7,8, 15,16,17). Prolonged ischemia represents an additional risk factor (18,19,20). Furthermore, a correlation between nonspecific inflammatory events and alloantigen-specific episodes has been proposed (3, 11,12,13,14). To optimize the utilization of grafts from old donors, studies on the impact of additional damaging factors such as prolonged ischemia seem critical. Because those factors are difficult to dissect in the clinical situation, we followed them individually and in their interactive state in a well-defined rat model of chronic dysfunction. The events have been followed in allografts and are of particular relevance for the clinical situation. In addition, the impact of increasing donor age was tested in parallel in native uninephrectomized animals. 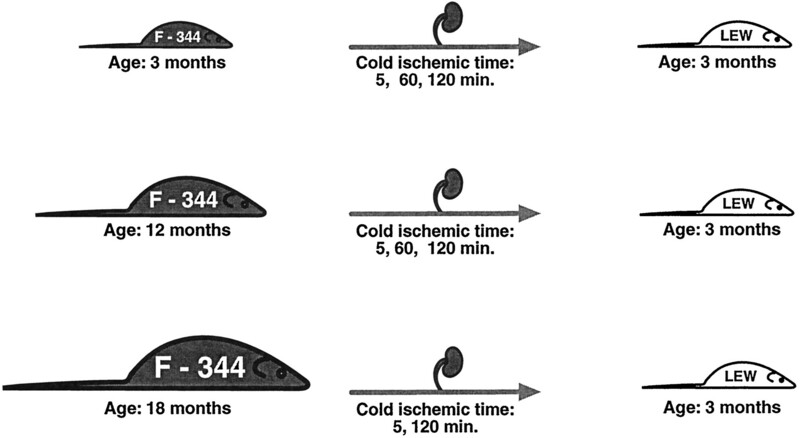 Cold ischemic times of 5, 60, and 120 min were chosen in our model, as we and others observed advanced long-term changes when ischemia was prolonged to 60 and 120 min in rat renal allografts and isografts (18,19,20), while prolonging cold ischemia to 240 min resulted in only 50% long-term surviving recipients (unpublished data). Our findings demonstrated a synergistic relationship between donor age and prolonged ischemia. This effect was most pronounced in grafts from 12-mo-old donor animals in our model. Graft deterioration in organs from young donors with prolonged ischemia was comparable to those of grafts from older donors with moderate prolongation of ischemia. Changes in grafts from old donors with brief ischemic times were already advanced and increased only slightly when ischemia was prolonged. Interestingly, no significant differences were observed between uninephrectomized native controls of different age groups and corresponding allografts with brief ischemic times. Overall, cellular infiltrates advanced with increasing donor age and progressed further with prolongation of ischemia. Both proteinuria and creatinine clearance demonstrated progressive functional deterioration in parallel with increasing donor age and prolonged ischemia. While proteinuria peaked in grafts from 12-mo-old donors with an ischemic time of 120 min, creatinine clearance was lowest in grafts from 18-mo-old donor animals with prolonged ischemia. Different findings in our model analyzing proteinuria and creatinine clearance may reflect a distinct impact of prolongation of ischemia in relation to advanced donor age. Although creatinine clearance was measured only at the beginning and at the end of the observation period, these findings may reflect a reduction of the total number of functioning nephrons with increasing age and prolonged ischemia, while increasing proteinuria may demonstrate decreasing glomerular and tubular integrity. The selectivity of proteinuria has not been tested in our study. Delayed graft function as a consequence of increasing age and prolonged ischemia was not observed in our experiment ; however, a contralateral native kidney remained for 10 d after transplantation in our model. Experimentally, we were able to show that grafts from older donors performed satisfactorily for an extended time. Those results suggest that grafts from older donors may be used in certain situations. Reduction of ischemic time, increasing graft parenchyma, or transplantation in older recipients may represent new concepts when grafts from marginal donors are used. The reduced functional reserve of grafts from older donors, as shown in our experiment, and in several clinical studies (4, 16, 21) may be improved by engraftment of two kidneys. Clinical studies reported an improved graft function when grafts from marginal donors were transplanted into older recipients (3, 22, 23). Reduced immunologic activation in older recipients may explain those observations. The impact of prolonged ischemia was especially detrimental in grafts from 12-mo-old donor animals in our model, whereas grafts from young donors (3 mo) demonstrated only moderate changes when ischemia was prolonged. In the clinical situation, long-term outcome could potentially improve by brief ischemic times in relation to donor age, while the recipients of grafts from very old donors could benefit from the engraftment of two kidneys. It has been shown that nonspecific injuries result in an increased expression of growth factors and T cell proliferation (20, 24). Those events may activate the graft before engraftment, contributing to long-term graft deterioration, particularly in grafts of reduced functional capacity. Injuries as a consequence of nonspecific inflammatory events in those grafts could potentially benefit from donor pretreatment in addition to physiologic matching, i.e., offering grafts of older donors to recipients of advanced age. In summary, our results demonstrate a synergistic relationship of donor age and ischemic injury. Grafts from older donors may be used for clinical transplantation. Brief ischemia seems of particular importance in this situation. This work was supported by a grant from the Deutsche Forschungs-gemeinschaft (DFG/Tu 63/3-2).